Bring your honey bee themed baby shower or birthday party together with a centerpiece and table decoration kit. Each kit contains enough pieces to jazz up one table or spread the love among three tables. You'll receive three centerpieces, including one accordion folded centerpiece that can also be easily converted into a cube. Honey Bee Table Decoration Kit INCLUDES 1 large centerpiece, 2 scalloped centerpieces, 12 scalloped table confetti pieces and 24 round table confetti pieces. Honey Bee party table decorations are perfect for a baby shower or birthday party. Honey Bee party decoration kit SIZE 1 Accordion-Folded Centerpiece (may also be formed into a cube using the included stickers), 30" long x 7.5" tall; 2 Scalloped Centerpiece Stands, 5.5" wide x 5.75" tall; 12 Scalloped Table Confetti Circles, 2.5" diameter; and 24 Round Table Confetti Circles, 1.5" diameter. The unique design and variety of pieces makes this honey bee party decoration kit an impressive addition to any baby shower or birthday party. EASY TABLE DECOR: Honey Bee large centerpiece paired with the scalloped stands looks great down the length of a table or separated onto three different tables and accented with the confetti pieces. Get creative and use the table confetti for DIY party ideas, as well. Hole punch each scalloped circle and sting as a small banner, use as favor tags or add to candy jars. Yellow and black bee centerpiece and decoration kit will make a statement however you choose to use them. PREMIUM PARTY SUPPLIES: Honey Bee centerpiece and table decor kit is professionally printed on heavy-duty cardstock paper with a photo-like shine. They are individually inspected and carefully packaged by hand. Centerpieces and table confetti will arrive flat. Get creative with your DIY party ideas! 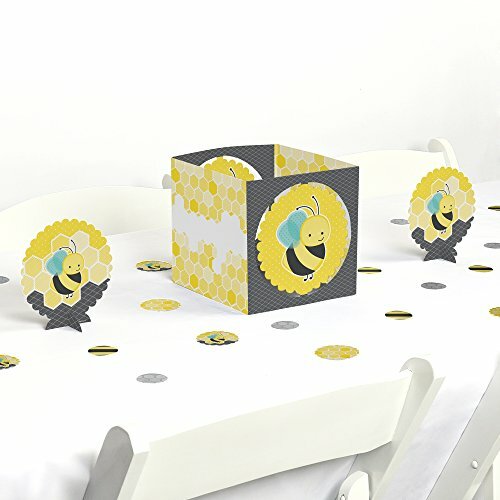 MADE IN THE USA: Honey Bee - Baby Shower or Birthday Party Centerpiece & Table Decoration Kit is designed and manufactured at our Wisconsin facility using materials that are Made in America.